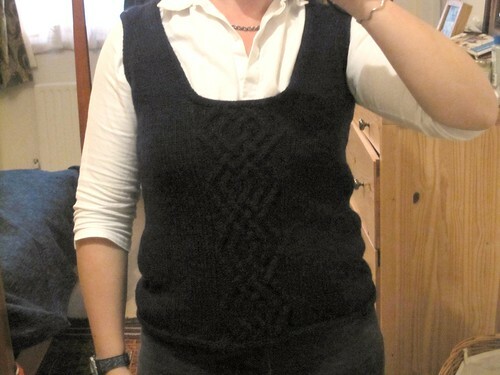 FO: It's not a V neck! Yarn: Some random, recycled from a Goodwill sweater, navy yarn. I had 750 yds/300 gr, and I used ~670/268 gr. Needles: US8/5.0 mm for body and bottom I cord edging, US 6/4.0 mm for arm and neck I cord edging. Comments/mods: First off, the yarn. I have no idea what this stuff is, but it could be Cascade 220? Hard for me to say, since I've never knit anything with Cascade. Relatively coarse, 4 ply worsted weight, in dark dark navy blue. It was fine to knit with - the cable came out great - but my fingers got really really sore on the tips. The only thing I can really pinpoint as a potential culprit is the coarseness of the yarn. Perhaps I'm becoming a delicate lily of the valley in my old age, but this is a first! So, the yarn worked well, and was cheap, but I'm not sorry I'm done knitting with it. And the few balls I have left over will become...maybe nothing. 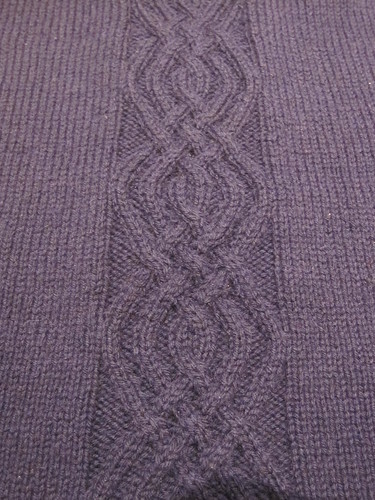 The pattern was a fun, quick knit. 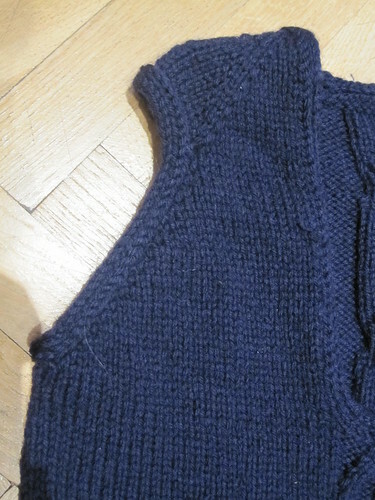 Top down, which is my new fave, mini-raglan seams, fairly mindless, but with a cable every so often to keep you on your toes. This was my first I cord edging, and I really like how it turned out. What a nice option for finishing off an edge. I didn't block this very emphatically. Just soaked it in some warm water and Soak, and laid flat to dry, smoothing it out to even out some of the stitches. I suspect that I could have gotten stitch gauge if I'd pushed it a bit, but it's fine as it is. 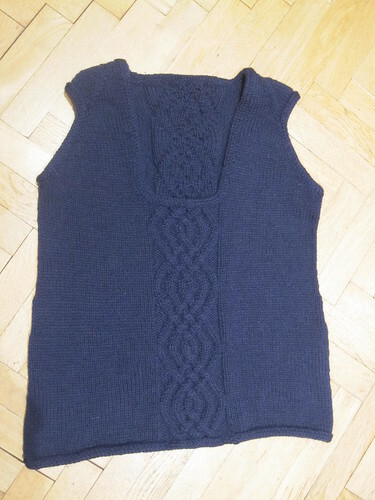 A hard color to photograph in October in London, but it's a cosy vest that is going to see quite a bit of use. Written by porpoise On October 23, 2009 In "FO", "stash", "vest"